A friend of mine could not use the "Prnt Screen" key to capture screen images in windows 7. He tried a variety of keyboard combinations to do this but none worked. I suggested he try the "snipping tool" that comes with Windows 7. All he had to do was click on the "start" button and then "snipping tool". The snipping tool looks like this after clicking on the down arrow in the "new" box. You can then select one of the four options to get a screen capture. After making a selection the snipping tool allows you to save the image to a file or do some simple editing on the image before saving it as a file or attaching it to an email. Open the "Computer" icon - you know - the icon that used to be called "My Computer" and navigate to the "C" drive and then to the "Windows\System32" directory and find the "snipping tool" file and right click on it. Then click the "Pin to Start Menu" option. 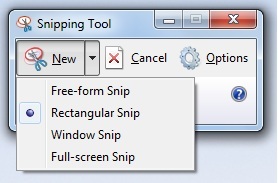 Now you should be able to open the start menu and click on the "snipping tool" icon to use the tool.